Pavlos Athanasiadis was born on December 23 1979 in Thessaloniki Greece , by parents whose origins are from Sourmena and Bafra of Pontos. He is a graduate of the school E.K.A.B “Emergency Medical Services” with a specialization in ambulance rescue crew. His pursuit in pontian tradition began at the age of 7 as a dancer and at the age 11 he began playing pontian lyre at the Association of Pontion Triandrias. At the age of 15 he was making appearances at weddings, dances, and cultural events. Within 16 years of engaging with the Pontic music, he has had the opportunity to work with several pontian cultural associations and to closely study with significant pontian artists. - Lyre player for the Farou Pontion dance group and the Stathi Eustathiadi choir from 1995 to 1997. 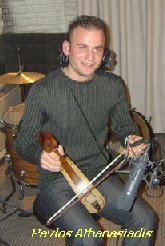 - Member of Greece ’s Northern Pontian Association as a lyre player from 2000-2006 with whom he has travelled to many destinations in Greece as well as abroad. - To date, as a lyre player of the Association of Pontion Triandrias dance group. - He is a founding member of the Center of Research of Traditional Dances “Kyklos”. He contributes in any way he can to preserve the Hellenic culture and inheritance. - He participates as a lyre player at Kyriako Moisidis seminars of traditional dances that take place in Greece but also in “ Canada , USA and Germany ”. - Pavlos has travelled to Pontos twice. In 2006 he professionally collaborated with the entertainment dance centre “Kortsopon” in Toronto , Canada . He also makes appearances at various cultural events with pontian associations of Thessaloniki and the surrounding areas. terms Pontic and Pontian can be used interchangeably.